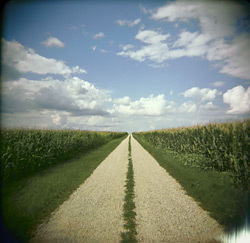 I photograph what I know best, and what I know are the farmlands, woodlands, wetlands and prairies on one Iowa farm. These photographs are autobiographical in the sense that they are about me, about the experience of being alive, about memories of what has already been and dreams of what could have been, and they are about looking beyond the horizon and embracing the mystery of what follows now. Of greater importance, the photographs speak of earth and the feel of rich, black soil, of trees planted by thoughtful, optimistic hands, of reconstructed prairies and the song of the returning meadowlark, of farm ponds and wetlands and of a hoped for future. That hope for the future is the development of a balanced and harmonious relationship between what we need from the land and what it can give.